If you're like us, you love apple pie or even just the suggestion of apple pie. 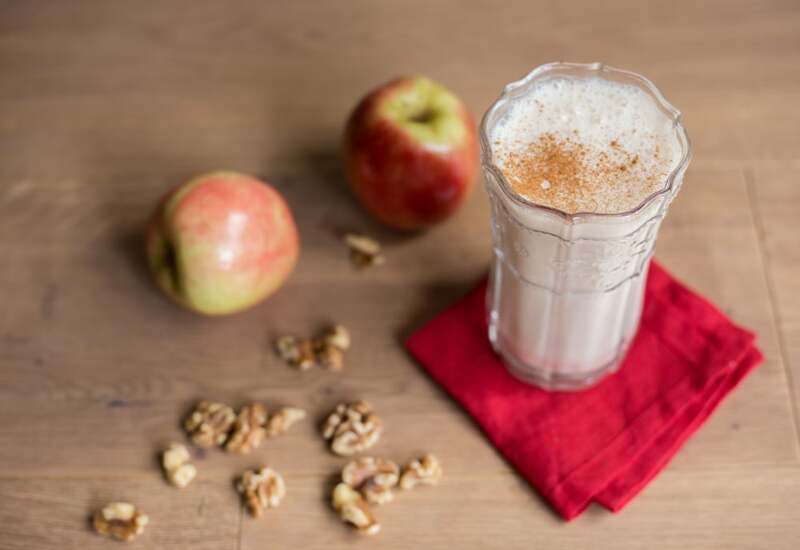 Maybe that's why we're unreasonably excited about this healthy apple smoothie with yogurt. It delivers the flavor of apple pie in a tall glass of frosty goodness. There's extra creaminess from soaked raw walnuts, sweetness from maple syrup, and delicious apple flavor from the best autumn apples you can find. Have it in the morning for breakfast or after a dinner for dessert or anytime in between for a satisfying snack. This recipe is super adaptable. You can swap in 2 ripe peaches for the apples to make a peach pie smoothie. Per Serving: 281 calories; 12g fat; 37.1g carbohydrates; 8g protein; 3mg cholesterol; 172mg sodium. This chilled, rich take on apple pie flavors is perfect for the dog days of summer -when you want pie without heating up the whole kitchen, this'll totally to do the trick. I did throw in a granny smith apple in place of one of the red apples and it gave just enough of that sour bite you'd expect. I'm obsessed with with apple pie smoothie! The walnuts and maple syrup flavors are incredible. What I love most is the yogurt, it makes it so creamy. The perfect consistency!